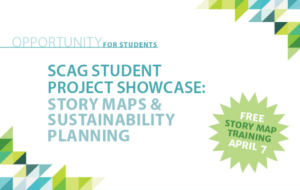 SCAG Student Project Showcase: Abstracts Due! ABSTRACTS DUE: APRIL 11, 2017 at 10:00 a.m. FINAL PROJECTS DUE: APRIL 25, 2017 at 10:00 a.m. The Southern California Association of Governments (SCAG) is proud to announce two exciting opportunities for college and university students to display their research at the annual Regional Conference & General Assembly on May 4 and 5 at the JW Marriot Desert Springs Resort & Spa in Palm Desert. This will be an opportunity for students to share their work with more than 1,000 elected officials, planning practitioners and various public, private and non-profit stakeholders.